On the West African Genus Hemichromis and Descriptions of New Species in the Museums of the Academy and Smithsonian Institution p. 139. Mormyrus anguilloides Linnaeus 1758. Type by subsequent designation. Gill (1862:139) described M. brachyistius and included it with anguilloides, tuckeri and zambanenje, but in key on same page (in error) associated cyprinoides with Marcusenius as the implied type, with anguilloides in Mormyrops. Gill 1863:44 designated anguilloides as type. Genus masculine. Today, universal practice is to regard Mormyrus cyprinoides Linnaeus 1758 as type species of Marcusenius, following Taverne 1972:165. Gill treated Mormyrus anguiiloides Linnaeus, 1758 as type of Marcusenius (and intended to designate it as such in his 1862 publication, but due to a copying error so designated Mormyrus cyprinoides Linnaeus, 1758 instead). 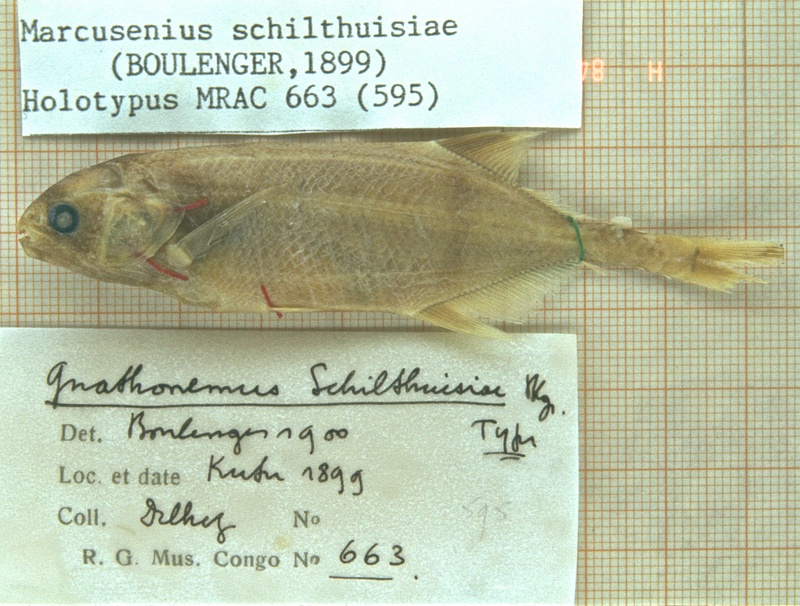 Ignoring both Gill's intention and his error, Boulenger treated Marcusenius brachyistius Gill, 1862 as the type species of this genus as did Pellegrin, Poll, Schultz and others. This genus is subject of an ICZN petition to stabilize its usage in preparation by Sullivan and Kottelat.